Friendship is something that can not be broken by time or distance. True Friends are always together where ever they are. Display your favorite photograph of your friend in this unique friend gift or give your Best Friend one of these lovely Friends Personalized Picture Frames as special way of saying I was thinking about you today. These Engraved Family Customized Picture Frames come in two great sizes. Choose either our 9" x 7" frame that holds a 3.5" x 5" or 4" x 6" photo or our 8" x 10" frame that holds a 5" x 7" photo. Easel back allows for desk display. Includes FREE Personalization. 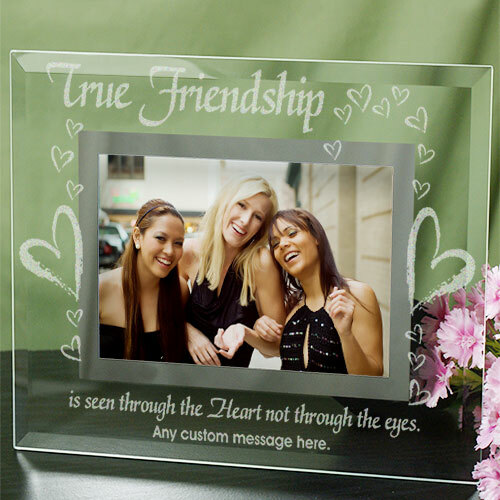 Personalize your True Friends Picture Frame with any one line custom message. I like it a lot, it's accurately customized and an overall grand gift. The personalized picture frame is a perfect gift for a friend. The engraving made the personal touch all the better. came out exactly as indicated on line. I was very satisfied! Additional Details Shop GiftsForYouNow.com for all your Personalized Friend Gifts. We are the leader in Personalized Friendship Gifts your best friend is sure to love and enjoy every day.